Image Size: 45"w x 30"h.
“No hostile Indians within two to three days ride,” reported the Army patrol as it returned to Fort Laramie. Just as the troopers’ mounts were unsaddled and allowed to graze the spacious parade grounds, a daring party of Oglala warriors, led by none other than Crazy Horse, burst across the field. Unnerved and dismounted soldiers scrambled in all directions. Before they could recover, the raiding party and their prizes were on the far bank of the North Platte River. Despite a 48-hour pursuit, none of the captured horses were recovered. Crazy Horse would always enter battle as he was shown by a thunder-being (wakiyan) during a vision quest. He would wear no war bonnet. A yellow lightning bolt was painted on his face and white powder, resembling hailstones, protected the vulnerable parts of his body. This great warrior did not fall in battle while protected by his strong medicine. Like many other great tribal leaders, he died under suspicious circumstances after surrendering to General George Crook at the Red Cloud Tribal Agency in Nebraska. Z.S. 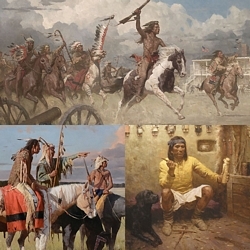 Liang’s "The Charge of Crazy Horse on Fort Laramie, 1864" was a feature painting at the 2013 Coeur D’Alene Auction, where the 40" x 60" canvas sold for over $180,000. The original may no longer be available, but you can own one the ten exclusive 45" x 30" MasterWork Giclée Canvases of this significant work or one of the twenty-five 29" x 19" Fine Art Edition Giclée Canvases. Crazy Horse was able to sneak upon and evade an entire military command, don’t let your own edition of this beautiful edition ride off as easily.